Vests is a little more forgiving than jackets for fit, but the basics are the same… choose a vest that will be big enough for both your chest and belly. After taking some measurements and trying some one, we find this vest to be cut like the jackets, which match the size chart provided by Black Brand (see below). Most people will be able to choose the size they normally wear in men’s clothing, but I’d recommend you throw a tape around yourself and check your chest and belly and make sure that the size you choose will be big enough for both. The vest has side Velcro adjustable straps. These straps are made to be snugged down, but not made to go bigger than the size chart indicates for Max Belly. You’ll be able to snug down the torso/belly by about. 6”. So if you have a trim mid-section and like a snug fit, this one ought to do you right. . 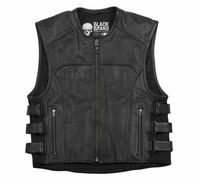 This vest is built for hot weather use! The leather is specially treated to repel the sun’s radiation and run cooler than comparable black leather. And most of the vest is perforated to let the air blow through. And the liner is a special material too. Search for the name brand of 37.5 and you’ll get some technical talk about it. This vest, like all other BB vests, has the zip-open liner so you can dd your club colors. I see two pockets outside and two inside and all close positively with zippers so your stuff won’t fall out. Sorry, no gun pockets in this one. Black Brand says: The Ice Pick KoolTeK Perforated vest is the coolest top-grain leather vest you can buy. Made from our exclusive KoolTeK leather that is proven to stay 20° cooler than standard leather in the sun and accentuated by full perforation; plus, a 37.5® inner liner, you can’t help but be cool on the move or standing still.